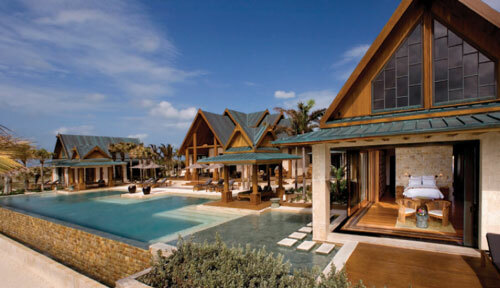 Nandana, an oriental oasis on Grand Bahama, offers its city-dwelling owners an exotic oceanfront private escape. 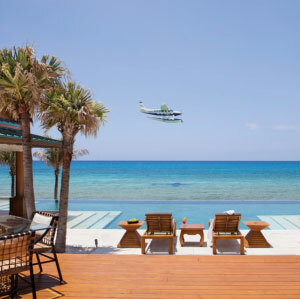 Taking place of pride on a narrow spit of land with the open ocean shimmering in front and a deep-water canal behind it, is a beach mansion that transcends time and place. Nandana’s soaring peaked roofs, intricate woodcarvings and extensive use of teak are unmistakably Asian, yet this sumptuous home is nowhere near the orient. 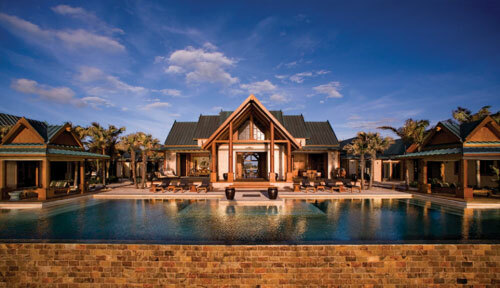 Rather, it sits, elegant but solid, on a secluded private estate at the western end of Grand Bahama. The main pavilion, with towering 40-foot ceilings supported by giant wooden columns, each hewn from a single tree, is the social heart of the home. This central building houses the kitchen, dining room, living room, bar and glass-fronted wine room, with glass doors opening onto the extensive beachfront pool deck. Teak reigns supreme in the main house, where vaulted ceilings and floors, not to mention the walls, are encased in the tropical hardwood. The beauty of natural wood held such appeal for the owners – being surrounded by wood is peaceful, they say, and Outside, a 120-foot infinity pool that spans the length of the house and cascades silently onto their private beach takes centre stage, with each of the four separate bedroom pavilions oriented towards it. Many of the antiques, sculptures, silks and paintings that grace the property were collected by the Salisburys on voyages through Thailand, Cambodia, Vietnam, India and Africa. In creating their oriental retreat in the west, they also designed the perfect canvas against which to display their travel treasures; in return, the keepsakes give the sumptuous property a uniquely personal touch. The oriental theme, which is visible not only in the overall design but in every detail – from the fabrics and carefully selected objets d’art to the 250 year old Javanese front doors – was inspired by the owners’ extensive travels in South East Asia, and in particular a visit to silk entrepreneur Jim Thompson’s house (now a museum) in Bangkok. “We fell in love with Thai style and architecture and wanted the same feeling of complete serenity closer to home,” say the owners, Patrick and Gigi Salisbury. Finding the tranquillity and seclusion they sought, along with the ease of access and proximity to their permanent home in New York in an oceanfront plot on Old Bahama Bay, they enlisted the services of Hawaii-based architect, Mark de Reus, to create a tropical beach mansion that would evoke the exoticism of the east, but adapted to fit their western lifestyles. The result is a commanding 10,000-square-foot property where east and west have merged, and where seemingly opposing qualities coexist easily: sturdy yet delicate, spacious yet intimate, there is as much privacy as there is party potential under bare feet, it feels soft – that they shipped eight containers of Burmese teak to The Bahamas and set up a mill on site. Over the course of two years, 20 ship carpenters from Germany cut, shaped and fitted every piece of wood that went into creating Nandana. The mellow honey tones are the perfect counterpoint to the Great Hall’s grand proportions, ensuring a sense of intimacy despite the scale, while the startling blues of sky and sea outdoors offer a fresh, cool contrast to the teak. Each bedroom suite is self-contained, with en suite bathrooms equipped with indoor/outdoor showers, some featuring private patios and Jacuzzi bath tubs, one with its own plunge pool, another with floor-to-ceiling glass walls on two sides that can be magically and fully retracted, opening the room to the elements. A fifth, quite different sleeping option located on the canal side, is the 2,000 square foot Canopy Suite. A spacious safari-style tent, which includes a sitting area, bedroom and bathroom, under what seems like acres of billowing white canvas and cotton, is undeniably romantic – and just a little bit daring. Complete with modern conveniences like air-conditioning, Internet and television, it is a concept the owners came across on a trip to India and decided to recreate in their own personal haven. Both magnificent and intimate, opulent yet informal, Nandana captures the spirit of the East, but anchors it firmly in the west. A tropical sanctuary offering every imaginable luxury, total privacy and a wholly restful experience, Nandana more than lives up to its name – the Sanskrit word for ‘paradise’.